Leduc’s first school occurred shortly after a schoolteacher from Ontario arrived, by the name of William Douglas. Bill had suffered from Polio in his youth and did not have use of his legs and one arm. The community accepted him as they recognized his intellect and he had experience as a teacher in Edmonton. The community did not have enough students to support a full time school, but Robert Telford and area settlers decided to build a log cabin school close to the present day QE 2 Highway and located near the creek. Late in December of 1893 Leduc’s student population hovered over the required six students needed to be recognized by the Northwest Territorial government and was given a district number of 297. Leduc’s organization papers showed William Douglas, Mike Barrett, and John T King as sponsors, with Robert Telford and Alex Fetherston serving as the first school board members. The school was opened from May to October, but Mr. Douglas had to give up teaching as when the rains and the mud came he found it too difficult to use his crutches to go to and from the school. Mr. Will Woods replaced Douglas and was followed by a Miss Cornett. Miss Cornett would marry Reuben Douglas, Bill Douglas’s nephew and they moved to Thorsby. Eventually Douglas partnered with Telford and opened a general store called the Pioneer Store and Leduc had grown to three buildings. The community expanded again when Robert Dittrich opened his shoe shop. Douglas became Leduc’s first homebuilder when he paid Telford $15.00 for a house lot in 1893. He would become Leduc’s first president of the Leduc Businessmen’s Association. He died in 1907 at the age of 56. From 1893 to 1895 Leduc’s population saw as many people leaving, as coming and the school remained as a one-room school. Beginning in 1895 a number of settlers from the United States began to immigrate to the Leduc area and was soon followed by settlers from Germany and Norway. By 1895 the student population had increased to allow a full time school and the school year changed to the familiar September to June schedule. The spring of 1895 James Simonton’s settler’s effects arrived in Leduc and inside the boxcar was a man called John Moran. John, shall we say, was a round man and was full of himself. Some said he was a pompous man. He claimed to be a gentleman from a well to do Montreal family who had been a pioneer from Kansas. He was hired as Leduc’s first full time teacher in the fall of 1895. He was provided a small log shack with a dirt floor and little furniture as a teacherage and a small salary. It did not take long for the students to develop a respect for Mr. Moran as he approached the position as a professor and his size reduced any possible discipline challenges from students. Parents could see their children were learning and the students were satisfied with their progress. By 1898 Leduc’s school population had increased to the point the community had to build a new two-story school. In 1901 a Miss Kate Timney was teaching 27 students and by 1903 the school’s population had increased to 52 and D. C. McEachern had joined Miss Timney as principal and teacher. Over the years Leduc has seen its share of disastrous fires and in 1911 the two story wooden framed school was burnt to the ground. 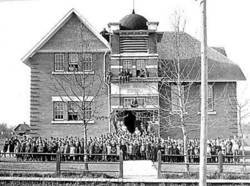 The community would rally and in 1912 a two story brick had replaced the school and was named after King George V. The school would serve Leduc until 1965 when it was demolished and replaced by a number of other schools. The King George School bell, which use to remind students that classes were about to start now hangs in the atrium of Leduc Estates School.